"Kumiko, The Treasure Hunter" is a strange, dreamlike film. Rinko Kikuchi (The Brother's Bloom, Pacific Rim) plays the title character, a shy, depressive that's been run down by a life of expectations she can never live up to. Worse yet, what she believes is her one chance to get rich, and prove herself to all the people who doubt her, is based on a lie. This film is based on the false legend of Takako Konishi, whose real life was far more tragic (I'll leave you to look up the real story on your own for fear of spoiling the film). The media misinterpreted her journey as one of attempting to discover the location of the money that Steve Buschemi's character buried toward the end of the film "Fargo," having herself misinterpreted the film as a true story. Of course, sometimes the true stories aren't as interesting, or perhaps bizarre, as the legends that take their place. As such, it's the legend that served as inspiration here rather than Konishi's real story. The telephone game taught us when we were kids that a simple story can quickly become misconstrued when it's allowed to be told from one ear to another. However, when that story also has to cross a language and cultural barrier there's even greater chance for misunderstanding. This is how we can understand both the misinterpreted legend, and Kumiko's quest. She's run down, mentally depressed, and looking for something life changing. After finding a VHS copy of "Fargo" she's convinced by the title screen at the beginning that claims it's a true story. By the end of her viewing, she sees an opportunity to cash in on the treasure left behind. Be it desperation or mental handicap (which the film makes plausible, but never confirms or denies), she misinterprets the film as some sort of reality TV documentary. So she prepares to travel to Fargo to find the money by gathering maps, studying the film frame by frame, and writing herself a "grail diary" with which to track down the buried treasure. She bides her time, working at her nondescript office job, where she serves as personal assistant to a man who pressures her almost as much as her overbearing mother. Her mother calls her repeatedly to question if she's finally found a husband, reminding her that at 29, she isn't getting any younger. Worse yet, when Kumiko has to admit she hasn't, the mother tells her she's wasting her time and money living on her own, working at the office. If she isn't pressuring Kumiko to get married, she's pressuring her to move home. Both of these demands are met with angry silence. Kumiko has clearly heard all she can stand. However, to make matters worse, when she heads in to the office, her boss meets with her to echo her mother's sentiments. He questions her desire for the future. Does she want to move up in the business world? The indication is that they both know her job is already a dead end. Worse yet, he reminds her of her age again. "You know most girls are married by 25, and have kids by your age," he confronts her. She walks to the building housing her workplace in a red sweatshirt. It stands in contrast to the bustling crowd of business types in their black suits and professional attire. However, upon her arrival she trades it in for the standard issue company uniform. To make her work life even less appealing, she's clearly the outsider the other girls don't respect. The rest of the women that work there are younger. They wear makeup, and excitedly talk around the break room about where they get their hair done. Kumiko arrives late to work with wild, disheveled hair by comparison. She doesn't wear makeup, and keeps to herself. She doesn't fit into this corporate world. After work she runs into an exuberant old friend, but the conversation is entirely one sided, as Kumiko awkwardly keeps from maintaining eye contact, and doesn't seem interested in speaking with her. They meet up later on, perhaps inadvertently. The friend, having brought her daughter with her, asks Kumiko to watch her while she heads to the restroom. Kumiko looks on the child with a mix of anger and pain. The child is a reminder of the societal pressures weighing on her. Is she a failure for not being married and having children of her own by now? Not wanting to face the question, she flees the situation. Once she makes the trip to the cold, wintry Midwest USA, she's met with the challenge of people trying to "help" her, but in doing so keeping her from going to Fargo. There's a humorous scene in which Kumiko gets taken in by an elderly lady who tries and fails to relate to her. Humorously the old lady tries to introduce her to James Clavell's novel Shogun, simply because it takes place in Japan. Sometimes we'll try anything to break the cultural barrier. Later she meets a helpful Sheriff, played by director David Zellner himself, who comically, mistakenly takes her to a Chinese restaurant hoping the workers can translate for him. He does, however, prove to be a kind, helpful friend to Kumiko, the point of which is pained by her extreme lonesomeness. As someone who has been on both sides of the cross-cultural interactions depicted here, there's a truth to the scenes. I've been the person in a foreign land trying to communicate, and I've been around to see foreigners try to communicate with small town people who try, and unknowingly fail, to relate to them. Most of the film's subtle humor is in these scenes. They're both humorously awkward, and painfully sad in that she seems to have found a new repression from accomplishing her goal. However, they do, I feel, work for humor, yet not in an over-the-top sort of way. They are darkly comedic scenes, however, they are a bit overshadowed by a fairly constant sense of dread. It's made all the more poignant by the beautifully moody score by The Octopus Project, which plays over cinematographer Sean Porter's beautiful imagery. Both turn more eerie as the film turns more hauntingly dreamlike. Rinko Kikuchi's performance is subtle, but brilliant, even heartbreaking, particularly in her plight to make something of herself to impress her mother and co-workers. For all her struggles, we actually want her to find success, even if we think we know better. The fact that we can't help but feel bad because we doubt her as much as everyone else in the film is a testament to the writing and performance by Kikuchi. Undoubtedly her best scene is one in which she makes a teary eyed phone call to her mother toward the end of the film. I certainly always appreciate films that bridge cultures. Often enough we see films about westerners traveling in Asia, but rare is a western film that offers the reverse. 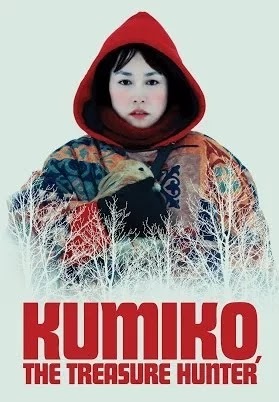 I found "Kumiko, the Treasure Hunter" a pleasant surprise, despite it's somewhat slower pace. It's a hauntingly beautiful and affecting little film. While this film has been making the festival rounds since 2014, it had not seen a wider release since this year.